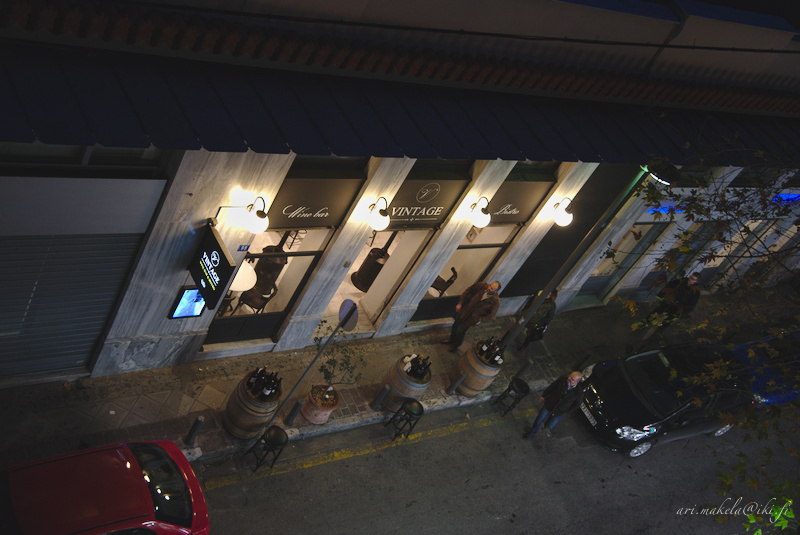 Vintage Wine Bar & Bistro could be seen from the balcony of our room. On Saturday, 8th of January we left the Sfakiotes Residency with heavy hearts, already missing the residency cats. After a six hour bus ride we arrived in Athens and took a taxi to our hotel, Plaka Hotel. The hotel was new to us and – this time we wanted to stay in Plaka area which is full of restaurants and cafés. Heidi had searched for restaurants near the hotel and had spotted Vintage Wine Bar & Bistro just around the corner. We reserved a table for two, which was a good idea, because the restaurant turned out to be immensely popular and fully booked. The second floor is darker and more intimate. However, it does not open before 8 PM. When we travel we want to eat and drink local products. 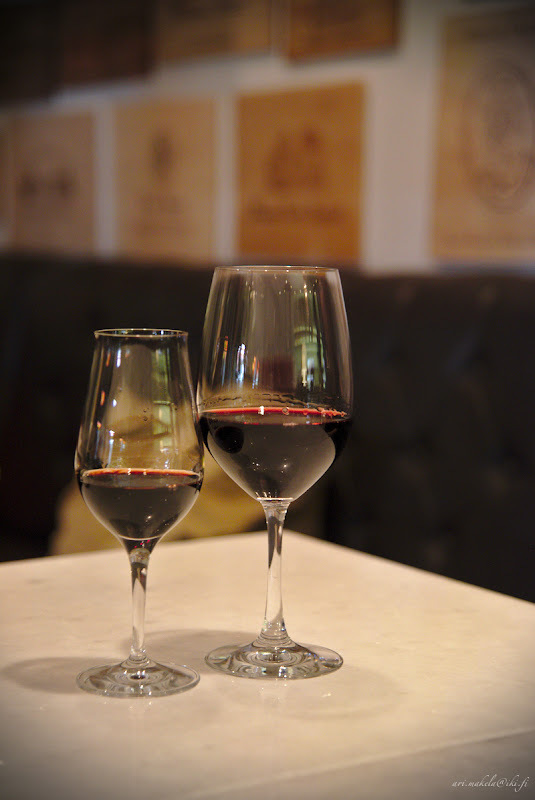 We really wanted to try out good Greek red wines, deep, full-bodied and robust unlike the light table wine which the tourists usually drink. 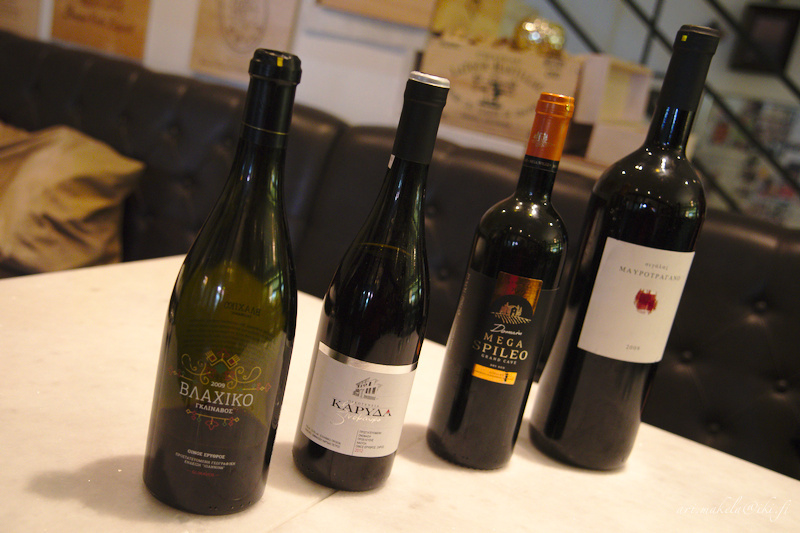 We ended up tasting four different red wines from different parts of Greece. The lightest is on the left and the most robust is on the right. We ordered half a glasses of wine so we were able to taste more wines. For appetizer we shared a plate of excellent carpaccio. 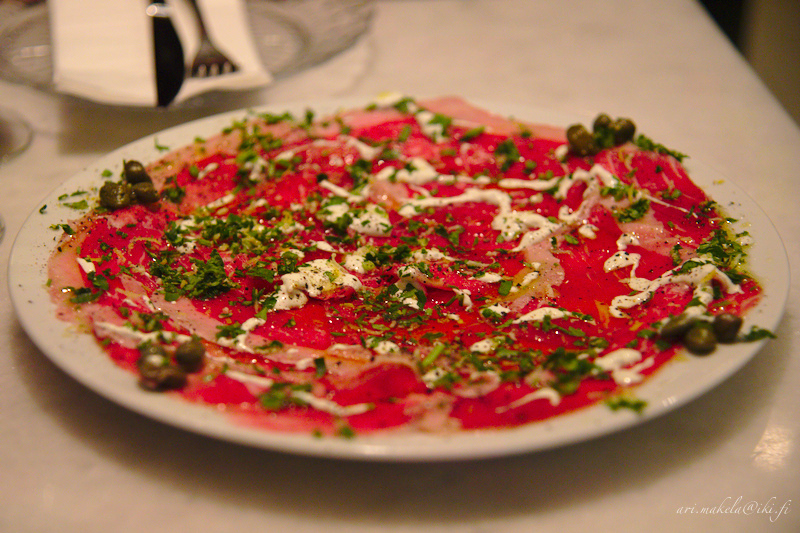 The carpaccio was very good, and my favourite of the portions we ate. Espresso glazed meat balls. 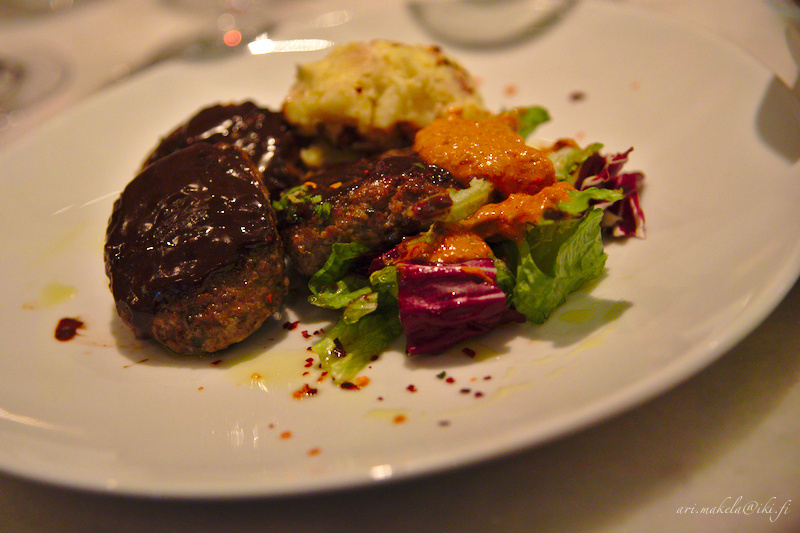 Main courses are served with salad at Vintage, with meat balls the salad is potato salad. I don't like coffee at all, but this time I wanted to try and I'm happy I gave coffee a chance. The portion was very good. The chicken was also very tasty. 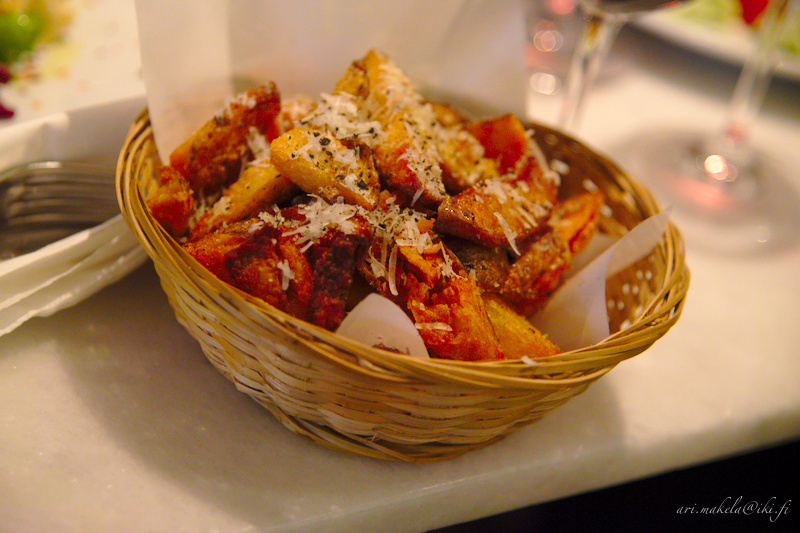 Potatoes with truffel and parmesan. 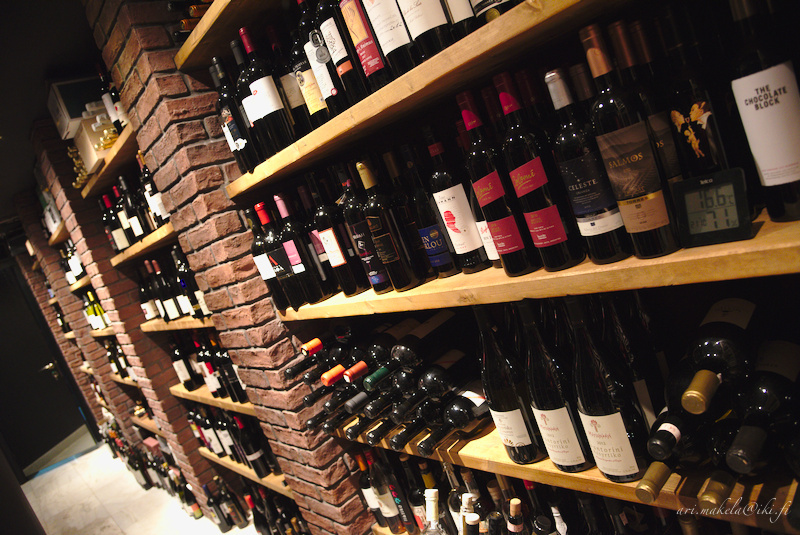 The restaurant has a wide selection of wines from every corner of the World. 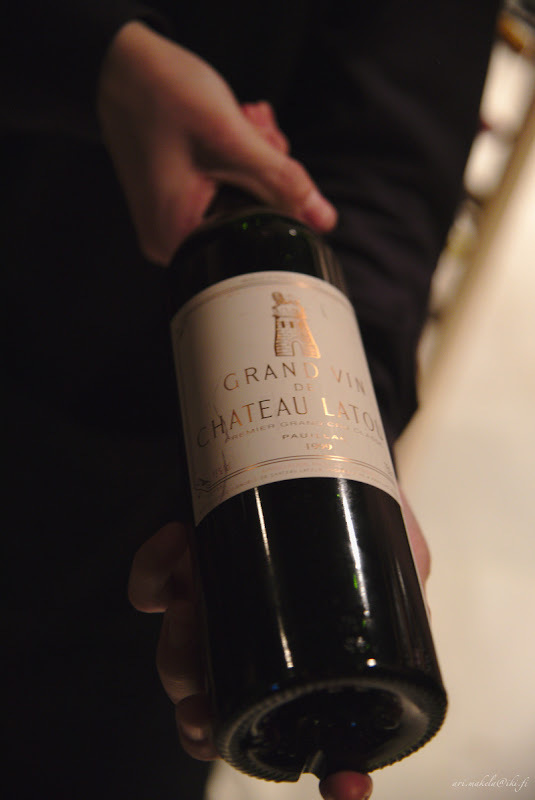 Château Latour is the most expensive wine in the restaurant and costs well over 1600 euros. 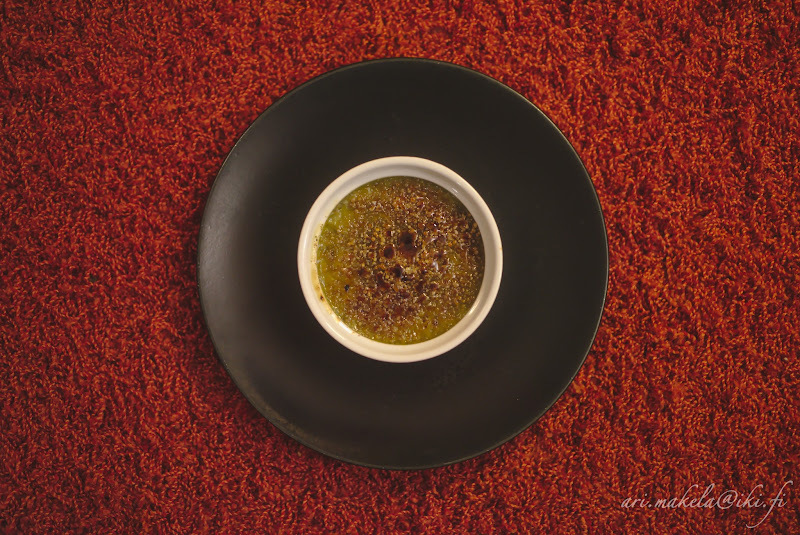 The restaurant does have Château Latour for those with wallets deep enough, but Vintage have also a lot to offer for everyone. 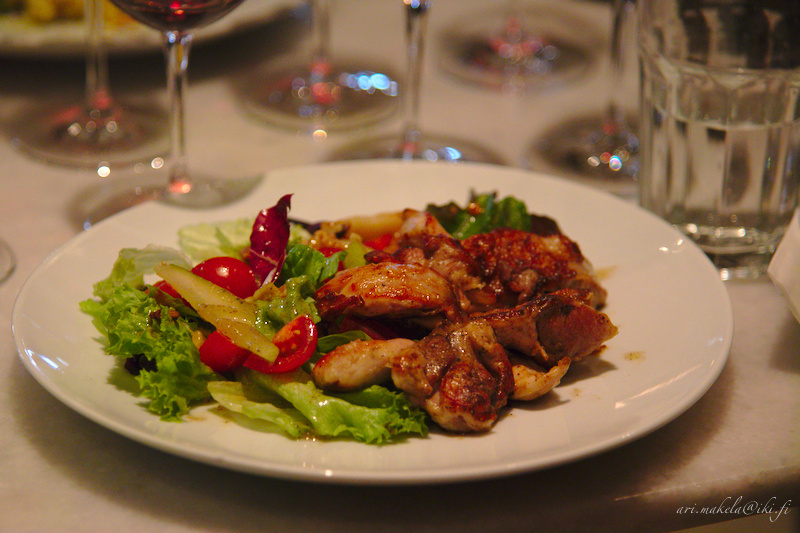 We got to taste five very good wines and an excellent dinner for a reasonable amount of money. Heidi selected the red wine from the big bottle. 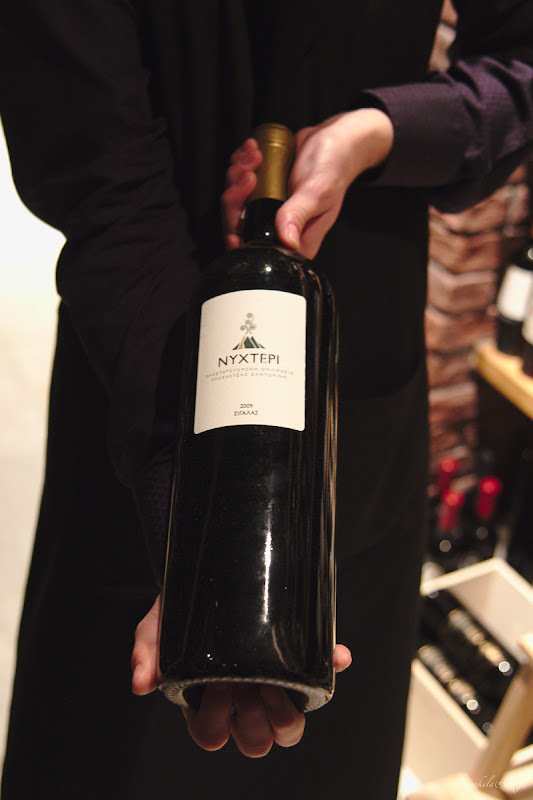 The name of the wine literally means black and crispy and it is from Santorini. I chose a sweed red wine, which is partly made of same grape variety. It turned out to be portish. Please do reserve a table as the restaurant is very popular. 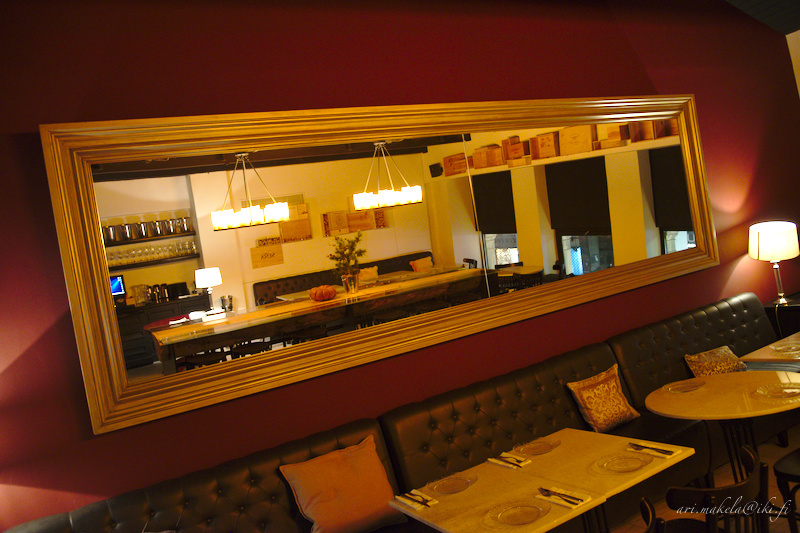 We had high hopes for Vintage Wine Bar & Bistro, but it surpassed our expectations. 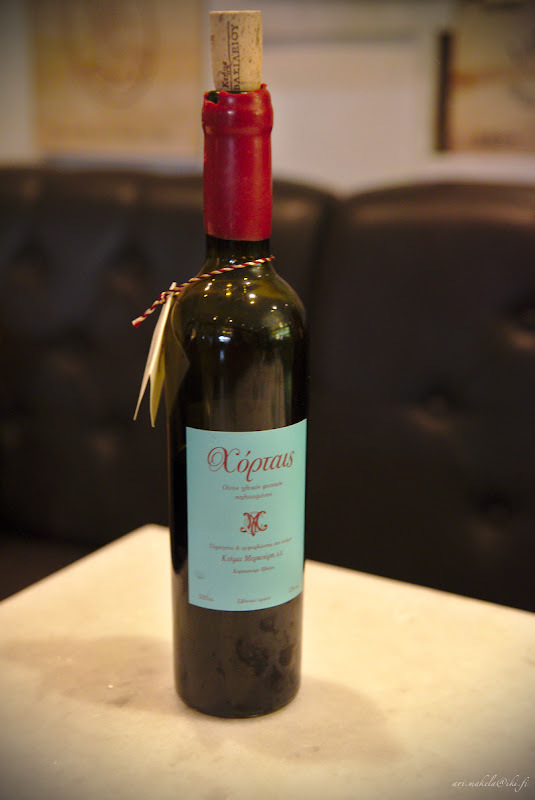 Food, especially the carpaccio, was delicious, and the wines removed our last reservations about Greek wine. Try them, give them a chance. They are excellent and quite affordable. 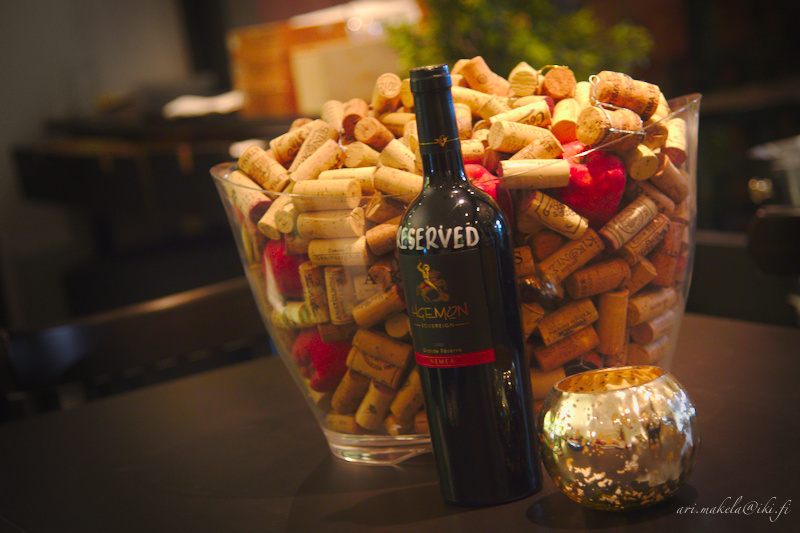 The staff knows wines well and is friendly. We heartily recommend Vintage.